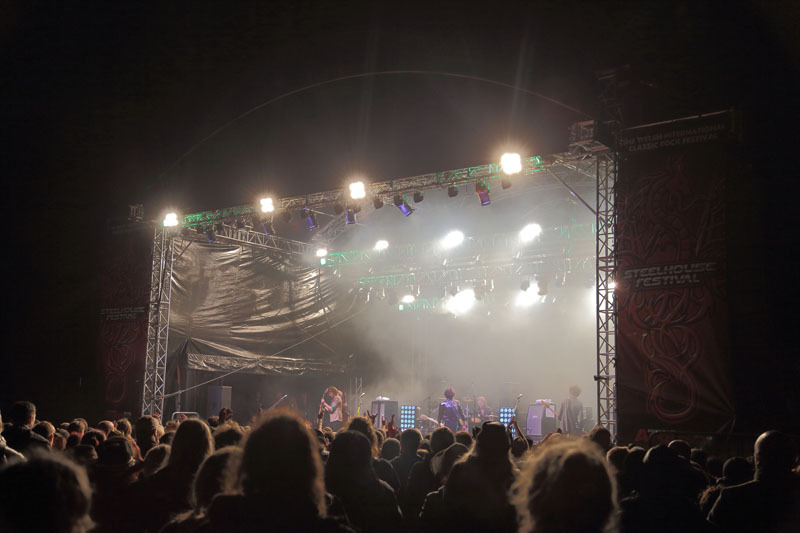 Share the post "Gig review: STEELHOUSE FESTIVAL – Ebbw Vale, South Wales, 24 July 2016 (Day 2)"
After the success of the previous day and coupled with great weather, arriving on site on the Sunday morning to damp and drizzly conditions soon brought us back down to earth with a bump. Sunday’s line up for myself was a little weaker in terms of headliners but I did have some golden nuggets early on in the day to look forward to, and the odd surprise also. At bang on half twelve Last Great Dreamers hit the stage to a rather poor gathering due probably to fans nursing hangovers from last night. Their style seemed to cross between Dogs D’Amour with the punky edge of The Ramones which didn’t sit too well with me, and it also didn’t help that their out front sound was really all over the place. The same couldn’t be said for Hand Of Dimes, who went down fantastically well. A local-ish band who have graced the stage here before on a couple of occassions. Fronted by the voice of Nev MacDonald who seems far more comfortable and assured in this more mature rock/blues sound, than he did in the last tenure with Skin. The band always enjoy themselves when playing live and that transcends into the great crowd assembled at the front. Pick of the bunch for me were the uptempo rockier songs like ‘Come The Hour’, ‘Looking At You’ and ‘Pinstriped Arrogance’ which no doubt will feature on the debut release in the autumn. Dimes were one of these nuggets I mentioned earlier. Toseland are one of those marmite kind of bands for some fans butthey put in a solid show that showed a far more cohesive band than that of previous times. James Toseland is a firm favourite of the ladies and knows how to work a stage of this size and connects well with the younger members of the audience but the music has taken on a different persona lately, and for the better. The latest material played seems more of a band effort than just a James Toseland vehicle. A lot of fans had questioned why The Dead Daisies were not headlining on the Sunday, given the calibre of musicians in this supergroup. Thier performance only reinforced this view. 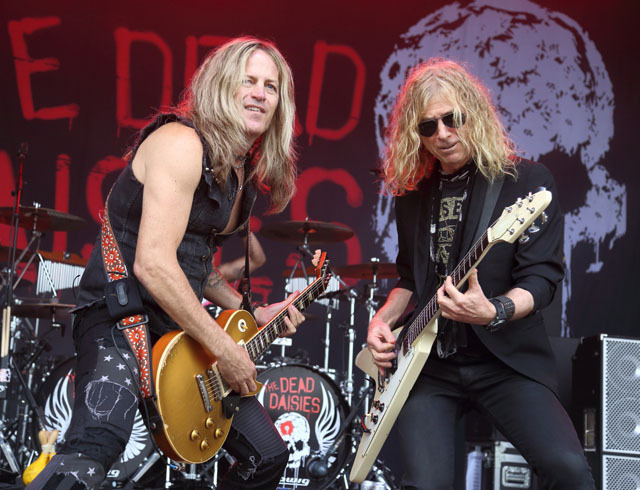 Latest gunslinger Doug Aldrich seems to have been the missing jigsaw piece that was needed to take The Daisies to the next level and bringing a harder edge to the songs. This being the third gig in less than 48 hours, they showed no signs of fatigue , they were flying and openers ‘Midnight Moses’ and ‘Evil’ segued into new album title track ‘Make Some Noise’ effortlessly. By now the weather was damp and wet, but things were hotting up on stage and the crowd noticably swelled for the Daisies set, even the inclusion of a drum solo by Brian Tichy didnt send any to the beer tent. 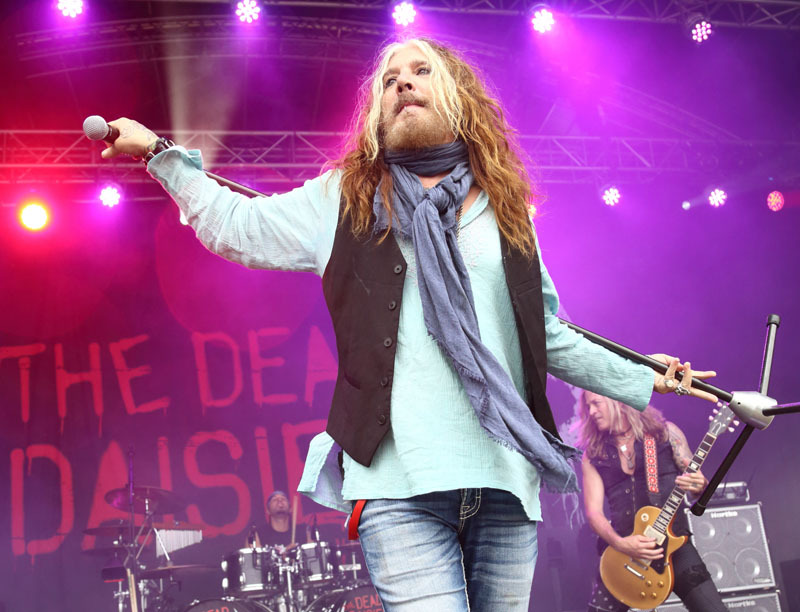 The Dead Daisies are fast becoming a band that is going to need bigger venues soon. The new album is a monster, and even better played live although with something like five covers in the set list which may have disappointed some people craving more original material. We’ve heard of Ginger Wildheartbut not maybe not his side band Hey Hello – a pop/punk sound more than suitable for a festival. Whereas Ginger is normally the main focal point, in Hey Hello he takes a slight backseat and hands over the duty to new vocalist Cat Southall, who does admirably well, even though the crowd had thinned rather a lot after The Dead Daisies. Back when Terrorvision were quite regularly in the charts, at a time when a lot of classic rock/ hair bands were falling by the wayside due to grunge. Being far more a melodic rock fan myself I didn’t really appreciate them. When they toured with Thunder back in February I foolishly went out to the foyer to meet with friends rather than watch their set. Terrorvision totally owned that stage today and you know a band are going down well when you are walking through the crowd and you have to avoid people dancing. Tony Wright is a blur of shape throwing and arm-waving, obviously having been tutored (in February?) by Danny Bowes. 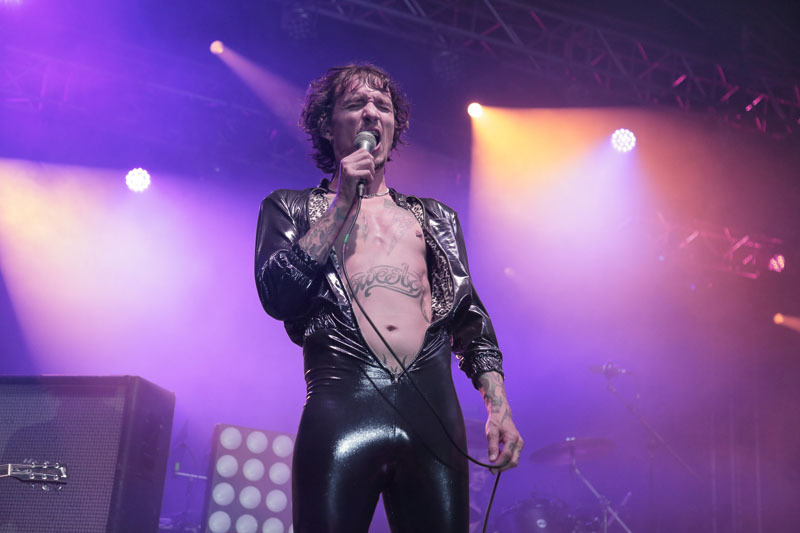 The Darkness were chosen to bring Steelhouse 2016 to a close and it will certainly be remembered for a long time not least Justin Hawkins resplendant in lurid purplish catsuit opened to the navel. ‘Growing On Me’ gives Justin a chance to show how an accomplished guitarist he truly is, sometimes it is a shame that he heavily relies on acting the clown which detracts from the musicianship. Taking to the back of the crowd for the remainder of the set, I see a fair few fans either going back to their tents or heading home beating the rush, a shame maybe but I think most people’s headline band of the Sunday had played fourth on the bill earlier in the day. All in all, Steelhouse had done it again, a superbly put together event. The organisers and family of volunteers work their proverbials off getting this all put together and this year’s event was a massive success. 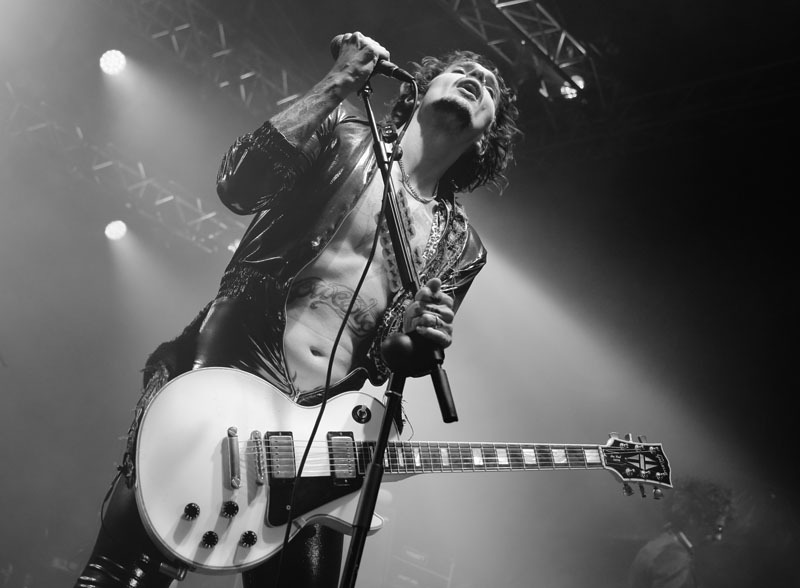 Two days of classic rock n roll – with bands of the calibre of Thunder, The Dead Daisies and The Darkness – how can you possibly go wrong? 2017 tickets are already on sale for £65. 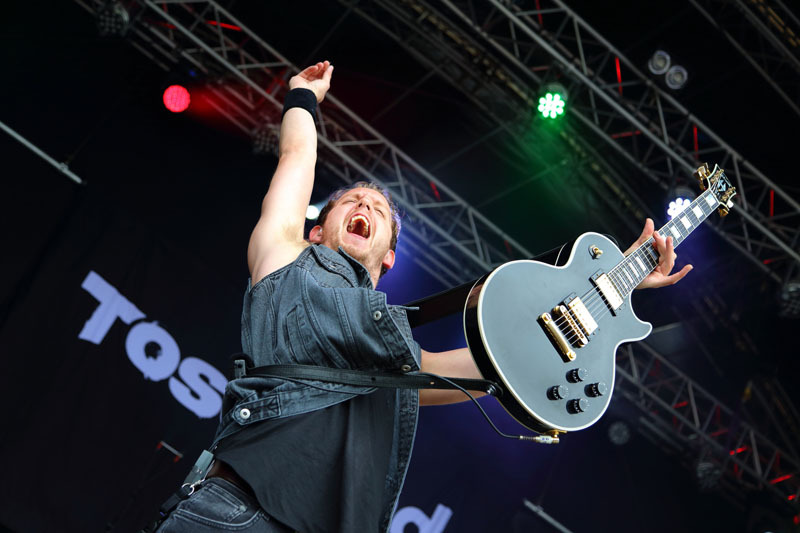 This entry was posted in All Posts, GIG REVIEWS, Special Events and tagged 24 July 2016, Brian Tichy, Doug Aldrich, Ebbw Vale, festival, gig, hard rock, Marco Mendoza, review, rock, South Wales, Steelhouse Festival, Terrorvision, The Darkness, The Dead Daisies, Toseland. Bookmark the permalink.